Wildebeests, also called gnus, are antelopes in the genus Connochaetes. They belong to the family Bovidae, which includes antelopes, cattle, goats, sheep, and other even-toed horned ungulates. 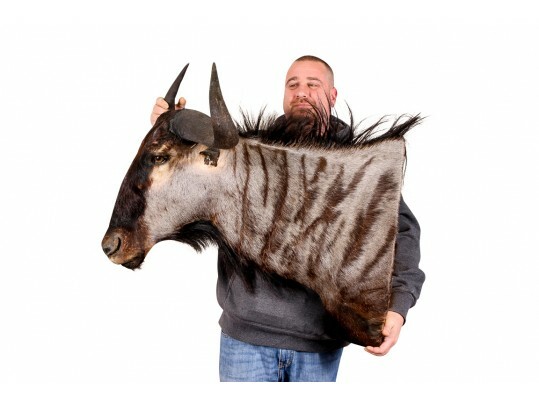 This majestic taxidermy specimen may be a blue wildebeest or brindled gnu, beautifully presented with very expressive eyes. Dimensions: 22" W across horns, 30" H from top of horns, 31 1/2" D from tip of nose to neck.